Who would have predicted it? Hercule Poirot reunited with Captain Hastings for Deal Noir 2017. 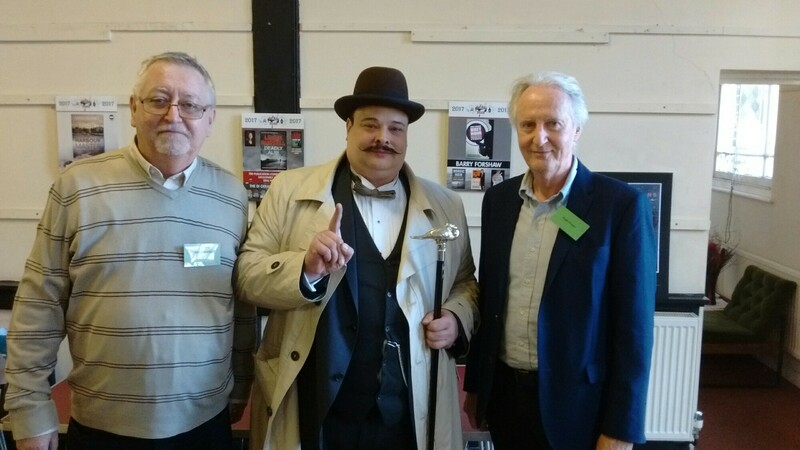 Bodies From The Library’s own Mike Linane (conference organiser) pictured with actor Sven W. Pehla and actor turned author Hugh Fraser. A full Landmark Centre on a sunny day in Deal witnessed a series of discussions on all aspects of crime fiction by panels of authors and critics. Attendees were able to put their questions to favourite authors and chat with them over coffee in the breaks between the sessions as well as get those all important signings of copies of their latest books. For now we can reflect on a super day and say thank you to the many people who told us how much they enjoyed the day. That makes it all worth while for us as organisers. But before too long we know we will be starting the planning for next year. Before then, however, we have our Bodies From The Library conference at the British Library on 17th June and we hope to see many of you again there.